"This is such an easy appetizer that never fails to impress! People are familiar with feta, but this traditional Greek way of preparing is not as well known. 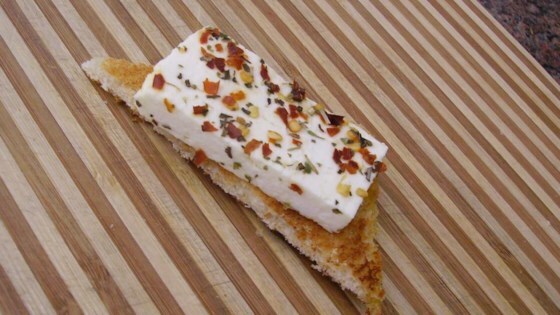 The salty/sour taste of the feta offsets the heat of the chili flakes - so don't be afraid to load them on! Serve with crusty bread or toast." Place the feta in an ovenproof baking dish. Drizzle with olive oil. Cover liberally with pepper flakes, and sprinkle with oregano. Bake, uncovered, in the preheated oven until feta is soft, about 10 minutes. very,very good.. perfect for sharing! But serve as soon as you take it out of the oven..